Tanisha Rivera, 32, of Lowell, is facing drunken driving charges after crashing her car into a utility pole in New Hampshire. 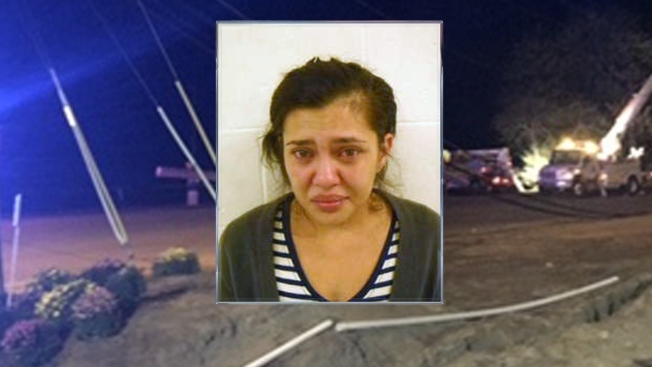 A Massachusetts woman is facing charges after she allegedly drove into a utility pole while drunk with her two children in the car on Tuesday night. Police in Pelham, New Hampshire, said Tanisha Rivera, 32, of Lowell, was driving her black 2007 Acura TL northbound on Marsh Road when she struck the pole. She told police she was driving to a friend's house when she struck the pole. Her two children - ages 7 and 12 - were in the car at the time and suffered non-life-threatening injuries. They were released into their father's custody at the hospital. Rivera was arrested at the scene and charged with aggravated driving under the influence of alcohol, driving under the influence and operating with a suspended license. She was held overnight at Valley Street Jail in Manchester and was scheduled to be arraigned in Salem District Court on Wednesday morning. The utility pole snapped as a result of the crash, knocking out power to some areas and forcing an immediate road closure. Schools in Pelham were also cancelled on Wednesday due to the power outage and road closure. They will reopen on Thursday. Marsh Road is expected to remain closed until after the Wednesday evening commute, and power outages may occur throughout the day as utility crews repair the pole.